MEASUREMENTS: ONKYO TX-NR1009 as HDMI / SPDIF DAC... Are AV Receivers any good? 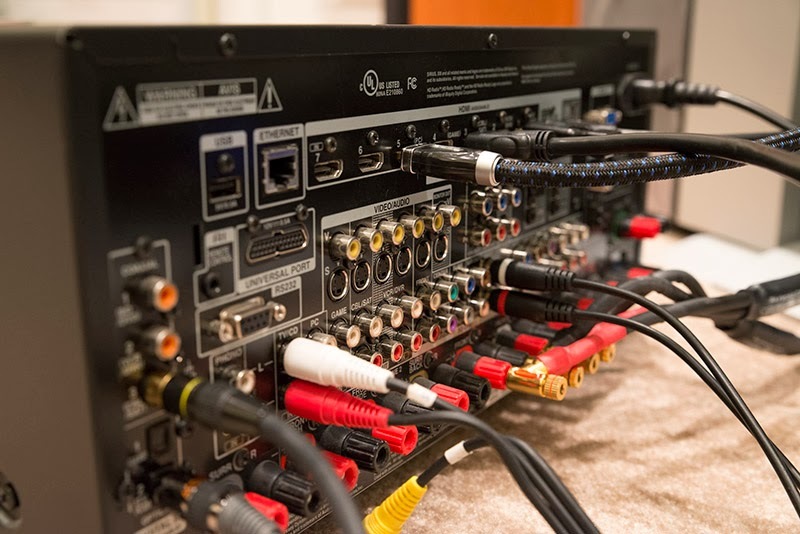 Running separate components like multichannel processors/preamps to monoblock amplifiers are generally considered the ideal, "cost no object" approach to home theater. 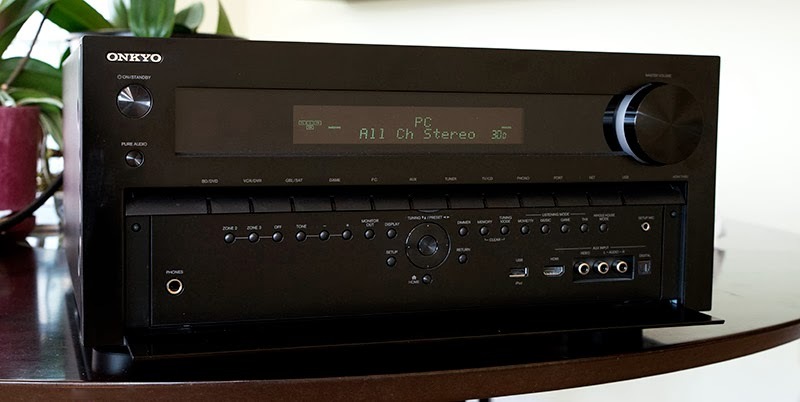 In the real world, cost and space are considerations and AV receivers become the "Jack-of-all trades" central device that most of us have in the home theater setup. But like the proverbial "Jack", it's useful to also consider the second part of that saying... Just how bad is he also "the master of none"? 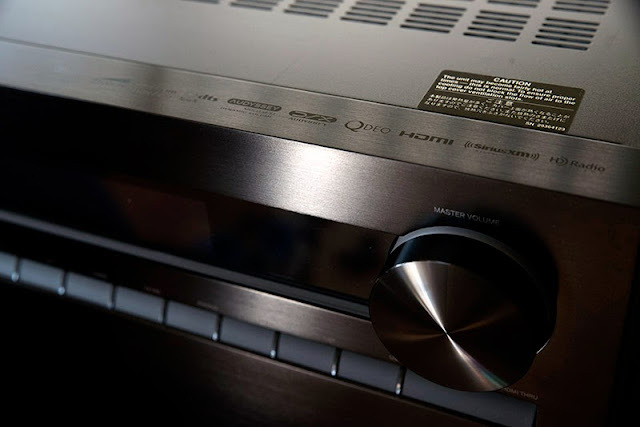 In the last installment, we looked at passing an analogue audio signal through the Onkyo and found that noise can be an issue. Today, I want to demonstrate the quality if we were to just use this device as a DAC - a look at the digital portion. Some natural questions arise - how well did the designers shield noise from getting in (especially in light of the high analogue noise measured previously)? Is the jitter through the use of HDMI "bad" (compared to TosLink and coaxial S/PDIF)? How does it compare to other stereo DACs? 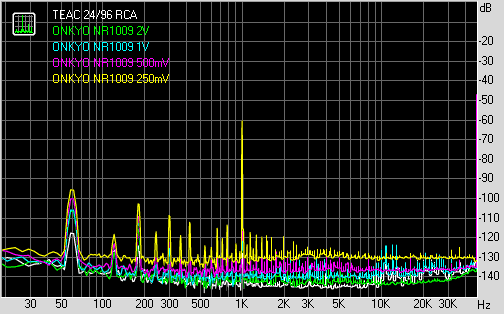 Based on the Onkyo specs sheet, the TX-NR1009 uses the TI PCM1690 6-channel + PCM1789 2-channel DAC chips. Both are rated as 113dB SNR. These DAC chips are often found in consumer AV receivers and are lower spec'ed than most stand-alone DACs like the TEAC UD-501's PCM1795 with >120dB SNR. 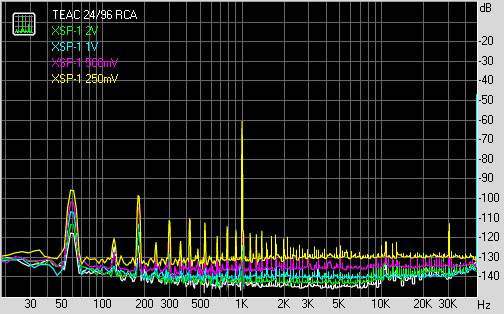 Of course, you cannot just look at this specification and judge the quality of a DAC. Much depends on the analogue circuitry around that DAC so the measured results are more useful than just looking at the components individually. CM6631A device used for asynchronous USB --> coaxial / TosLink conversion duties. HDMI driver: default AMD WASAPI. 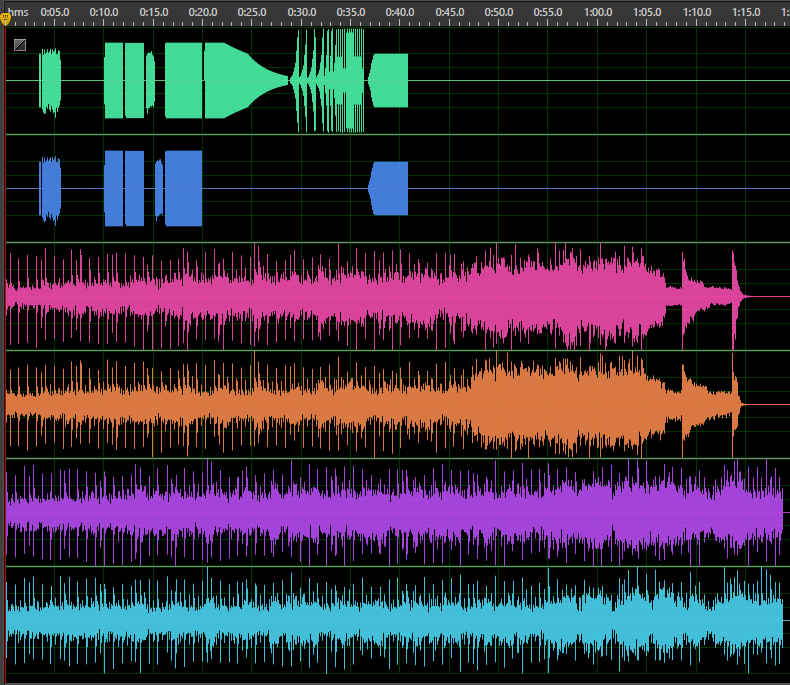 I used JRiver for playback. Since I want to check the performance in a more "naturalistic" fashion, I made sure the TV was connected and on as well as my Blu-ray player (Panasonic BMP-TD220). Remember that in my previous post, plugging in the HDMI TV cable added significant noise to the analogue pass-through. All results were made with the Onkyo in "Pure Audio" mode to defeat any audio DSP/bass management. HDMI cable: A decent looking 6' length capable of high speed HDMI (officially rated as HDMI 1.3 but fine with my HDMI 1.4 3D TV), brand named "ION" that I purchased for something like $20 about 2 years back at a local computer/supplies store. TosLink and coaxial SPDIF cables I'll be using for comparison are the "Acoustic Research" branded 6' lengths I measured previously (see links for details). 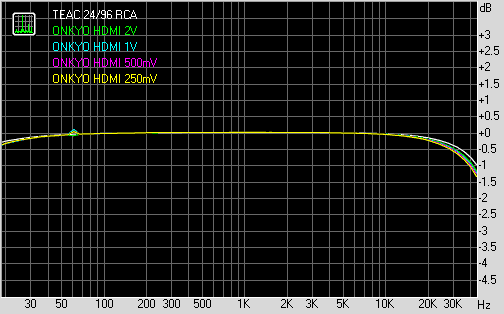 Here is a 0dBFS 1kHz square wave sent through the HDMI and measured off the front stereo "pre-out" RCAs. Not bad - good square waveforms with excellent channel balance (sorry about the pixellation, usually screenshot looks better than that). With the receiver volume set to the "reference" of 85 (there is a little popup on the front screen when you hit 85 that correlates to the 0dB THX reference level) and in "Pure Audio" mode, the peak voltage is around 2.3V. 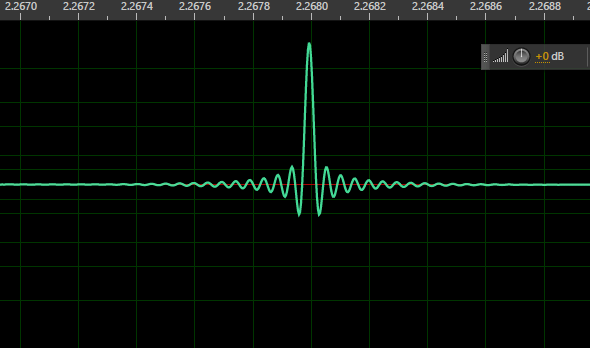 Good linear phase impulse response, nothing fancy here. Absolute polarity also maintained by the Onkyo. As you can see, I've also included for comparison the results at 24/96 for the Squeezebox Transporter and TEAC UD-501 (unbalanced outputs) - two of the best measuring DACs I've tested here with the same hardware/software. 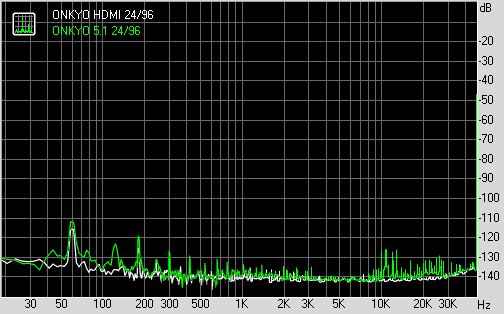 Clearly the Onkyo is capable of hi-res with >16-bit dynamic range. 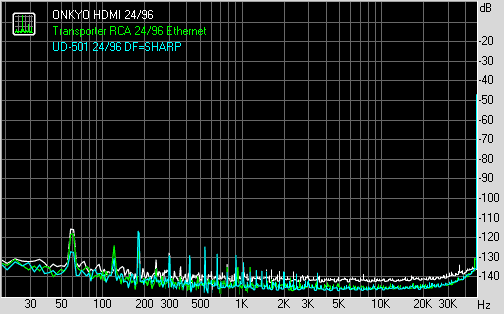 With 24-bit data, it can do ~109dB dynamic range which equates to just over 18-bits! Not as good as the dedicated audio units like the Transporter or TEAC but pretty darn good for an AV receiver! This result is about equivalent to the AUNE X1 and ASUS Essence One using unbalanced RCA output - however, those DACs had better distortion numbers. The Onkyo rolls off a bit more in the high end, a little more noisy, and notably more harmonic distortion. Yup, capable of 24/192 although the roll-off on the high end is obviously earlier than the TEAC UD-501 (Onkyo drops -3dB at 50kHz). Yup. They all look pretty good. The graphs all look identical except for slightly more high end roll-off with the HDMI interface compared to the SPDIFs - not sure why. II. 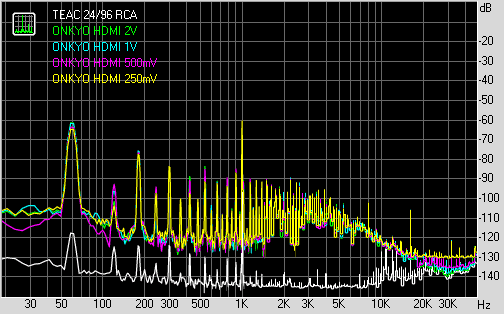 The 1kHz -90.3dB "Microscope"
With the dynamic range >16-bits, this test should be no problem for the Onkyo (HDMI input). That looks very nice given that many very expensive DACs are not even capable of this degree of resolution! 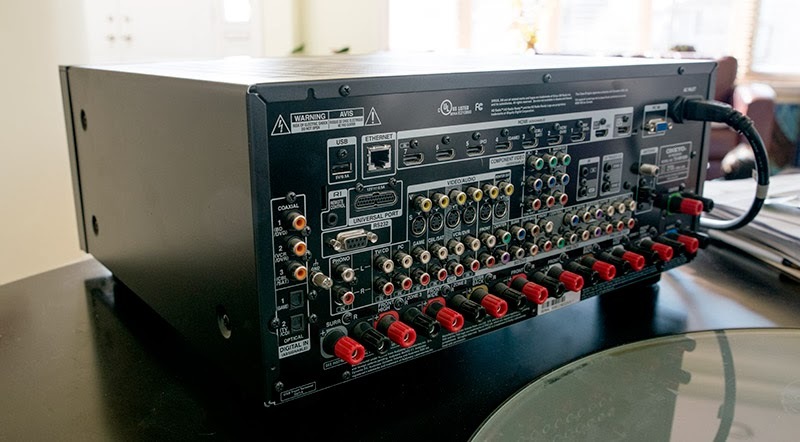 Again, this is an AV receiver! 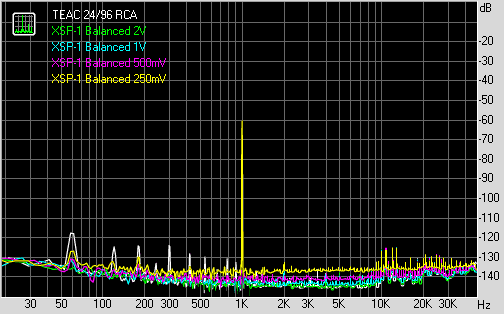 As I previously posted, even recently released DACs like the Wadia 121 Decoding Computer is incapable of this resolution. IV. Does sending a 5.1 channel signal degrade the measured performance? I thought this would be interesting to check out. I left the RightMark test signal as the two front channels and added some AC/DC "Thunderstruck" into the center, rear, and LFE channels played back in JRiver as a multichannel FLAC through HDMI. Beautiful ain't it?! The idea is to see if driving 6 channels (5.1) at the same time through the HDMI cable into the Onkyo's DAC will change the audio quality... For example, doing this might increase the noise floor, or perhaps worsen channel crosstalk since we've tripled the number of audio channels being processed. As you can see, there's very little difference whether 2 channels are playing or 6 channels. Great to see! Essentially no frequency response or crosstalk difference. However, there is a very small increase in noise level when playing multichannel... IMO audibly insignificant but measurable. Here you go folks! That's how a higher-medium end "modern" AV receiver measures as a stereo DAC. Of course, each model will be a bit different, but I suspect similar tiered receivers from Pioneer, Denon, Integra, Yamaha, H/K, Anthem, etc... should be comparable (won't know unless someone tests it out). Note that most magazines like Sound & Vision will measure receivers but usually in the context of power output and flatness of frequency response rather than on the accuracy of the digital-to-analogue conversion as I did here. In some ways I am impressed and in other ways the results were as expected. I was impressed by the low noise and very good dynamic range for example. To achieve almost 110dB in the audible spectrum is quite something especially considering the complexity of an AV receiver with all the potential electrical noise sources inside the box! The accuracy of the 16-bit -90.3dB waveform looks excellent; something which only the better stereo DACs or CD players would have been able to accurately reproduce a decade back. 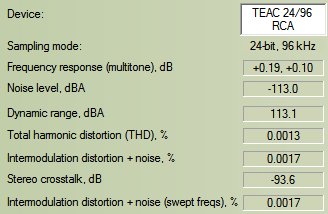 Likewise, the fact that the measurements remained excellent even with 6 channels being processed concurrently and only measuring about 1dB difference in the noise floor again demonstrates the engineering quality. 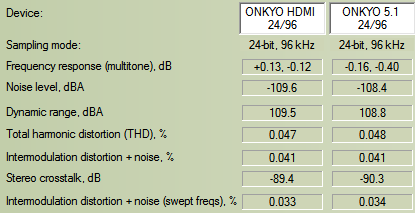 Given the results I found previously with HDMI noise polluting the analogue input, I'm guessing that Onkyo put more attention in optimizing the digital side which makes sense since most people will be connecting digital inputs for multichannel sound. Hmmm, it looks like HDMI jitter can be cleaned out after all (eg. Arcam, Classe, Pioneer)! It's about the implementation, not necessarily the interface itself. If you read around these posts, one also finds that the jitter value and subjective sound quality do not necessarily correlate. Let's think about the J-Test and what was found in measuring the Onkyo for a moment. The Dunn J-Test is a synthetic test of data jitter first published by the late Julian Dunn around 1994 which (in the 24-bit 48kHz version) superimposes an undithered LSB 250Hz square wave over a primary 12kHz -3.01dBFS sine wave which is of course an exact 1/4 of the sampling rate. This superimposition stimulates the effect of subtle timing inaccuracies (jitter) which can be demonstrated as accentuation of the sidebands measured in the spectral graphs. Remember that this test is synthetic and stimulative. 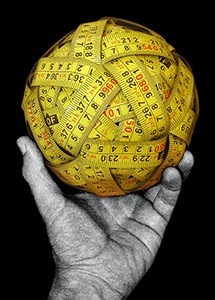 What you see measured is not something you're probably ever going to "hear" in real music! The noise floor is not going to be down to the last bit in 16-bit audio and essentially impossible with recorded 24-bit audio (unless it's purely computer synthesized music). Also, jitter is more pronounced in the higher frequencies (11kHz and 12kHz are used as the primary signals in the J-Test). Realize that the human hearing sensitivity is well on its way down by 5kHz (as can be seen by the Fletcher-Munson Curves). Furthermore, if we specifically look at the Onkyo's J-test spectrum, the most pronounced side bands are about -90dB below the primary signal. To make matter even less worrisome is that the tall sidebands are all +/-250Hz around the primary signal and the audibility would be masked even if one did have awesome auditory acuity at 11/12kHz and could hear a signal 90dB down! This is also why I feel adding up all those sideband peaks and calling it a number (whatever picosecond or nanosecond) is really not all that useful when it comes to audibility. What I'm trying to say is this... Tests like the J-test can demonstrate that jitter is a real phenomenon. Engineers should pay attention to it when designing hi-fi equipment. A discerning audiophile should be aware of it and if able to, can measure it themselves and decide if the engineer did a good enough job. 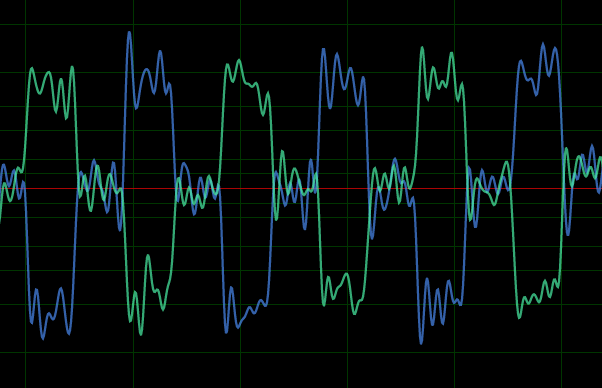 However, IMO, to say that jitter is somehow audible at these kinds of levels I think would be impossible. In fact, unless the jitter were ridiculously high (like Track 26 from Stereophile Test CD 2, where an insanely simulated 10ns sideband is inserted +/-4KHz around the 11kHz primary - again totally synthetic), the concept of jitter significantly deteriorating sound quality I believe is utter nonsense in the real world. That some companies would even consider using jitter as a reason for putative significant audible differences between passive "components" like cables is just not credible! I had a listen to the Onkyo's output over the last few nights with some familiar music - Ella Fitzgerald "Sings The George & Ira Gershwin Song Book", Grateful Dead "American Beauty", and Keb' Mo' "Just Like You". Also had a listen to Sting's new album "The Last Ship". They all sounded nicely rendered as they should with a good DAC. Great details with my older Paradigm Reference Studio 80 v2's which will be my rear speakers in the new sound room. The wife and I both enjoyed Sting's "The Night The Pugilist Learned How To Dance" - cute. So, even though the AV receiver might be the "Jack-of-all-trades", at least in this specific instance with the Onkyo TX-NR1009 as an HDMI DAC, he might not be a "master" at it, but I'd say he's a pretty decent tradesman :-). Well, unless I dig up something else to report, I'm likely "going dark" for the next month as I head off overseas for some work and then the big move to the new home. I'll be sure to post some pictures in time... Enjoy the music everyone! 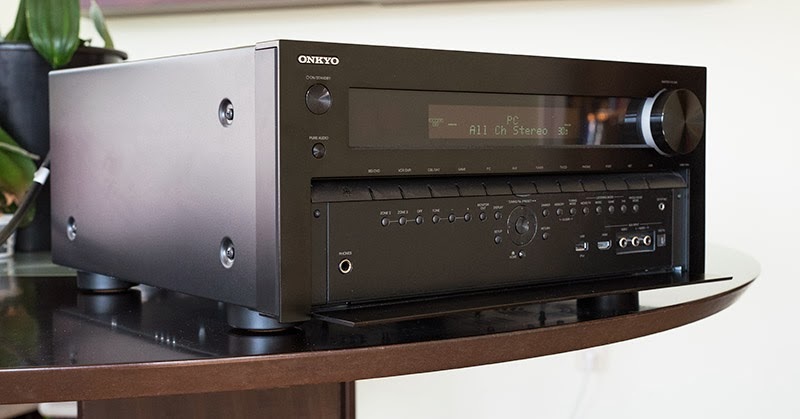 MEASUREMENTS: Separate vs. AV Receivers (Emotiva XSP-1 vs. Denon AVR-3802 vs. Onkyo TX-NR1009) as Analogue Preamp. Okay, so maybe I'm being a bit too dramatic using that epic battle between Godzilla and Rodan above :-). With the recent acquisition of the Emotiva XSP-1, I wanted to see just how well a separate pre-amp with audiophile design in mind stacks up against something more ubiquitous like the AV receivers out there. Remember that a preamp at its core has very basic functionality - it allows switching of the source and volume control by adjusting voltage gain on the output. The essential difference between a good preamp versus poor one (beyond features, ergonomics, remote control quality, etc...) is how well it maintains a high signal-to-noise ratio (SNR). If you supply a high resolution line level DAC output, you want to see that signal come out of the preamp with as much resolution as possible; this demands that the preamp introduce as little noise as possible. 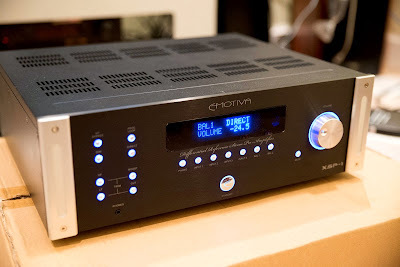 Currently the highest quality Emotiva preamp out. The claim to fame is the differential design for balanced operation. It provides 2 balanced inputs along with a host of unbalanced RCAs. Volume control is through a digitally controlled, analogue resistor network. For this test, I will not be using the analogue bass management or tone controls that could affect signal presentation / quality. SNR for this device is rated at >110dB across the board for both RCA and XLR operation. A 7.1 channel "classic" from the decade when SACD and DVD-A were starting life and home theater lovers started seriously investing in discreet surround receivers with Dolby Digital and DTS (as opposed to the matrix surround of previous Dolby Pro Logic receivers). Analogue 7.1 channels input available. I bought this unit back in early 2002. Though not the highest end back then, it wasn't cheap (I think I paid almost $2000CAD). I don't remember the results of actual 3rd party testing but the rated amplifier power is 105W into 2 channels at 8ohms with 0.05%THD. Analogue input SNR is rated at (only) ~86dB based on the table in the manual. 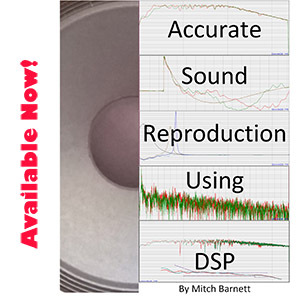 For the sake of measuring the best possible audio output, all measurements will be performed through the CD input in "DIRECT" mode which bypasses all processing including tone controls and bass management. Measurement will be off the front (stereo) channels of the 7.1 "pre-out" analogue outputs. My new receiver mentioned in the previous post. Capable of 9.2 channels processing with 7.1 analogue external inputs. Again, not the most expensive in the Onkyo line but certainly in the upper end of the previous generation released in mid-2011. Amplifier is capable of more power than the Denon with a rating of 135W into 2 channels at 8ohms with 0.08%THD. Sound & Vision measured it as 145W into 2 channels at 8ohms with 0.1% distortion. Line level SNR rated at 110dB. I'll measure it through the analogue CD input in "Pure Audio" mode where all extraneous audio processing is turned off. Likewise, it's supposed to quiet the video circuitry and even the front LED indicators and display are turned off. I will measure from the front (stereo) channels of the 9.1 "pre-out" analogue output. Firmware was updated to the latest version as of September 2013 - 1131-1399-0211-4108. First, I just want to discuss the general setup. The main thing I wanted to know was just how much resolution was maintained with the signal going through the preamp and look/listen to the results through a variety of levels standard across each device. The hope of course is that when we pass the above signal through the pre-amp, there will be minimal loss in resolution (noise level remains low around -113dB, and no change to frequency response to suggest "coloration" of the sound). In my previous TEAC measurements, I noted that the XLR output was too "hot" for the E-MU 0404USB without volume attenuation which drops the resolution. My guess would be that the noise level drops to less than -116dB. I will measure the XLR output from the Emotiva XSP-1 and see (it's the only device out of the 3 capable of balanced operation). Nice to see the volume control accuracy of each device - every halving of output peak voltage corresponds with a 6dB decline of the volume "knob". Notice that the Emotiva and Denon are using a relative system of volume control (dB below 0dBFS) and the ONKYO is set to an "absolute" measure between 0 to 100. This looks really good. At 2V peak output, the dynamic range at 111dB is very close to the "ideal" (113dB directly from the TEAC). Notice a very small amount of roll-off in the high end when using the Emotiva. Also as expected, when the volume is reduced (2V --> 1V --> 500mV --> 250mV), the signal-to-noise ratio goes down and we see a concomitant reduction in the dynamic range and rise in noise level. Well folks, proof that if you want absolute fidelity, you really need to squeeze out those last few dB's down below 110dB with balanced XLR cables! Irrespective of whether you can hear it or not :-)! Seriously, these are some fantastic measurements. As I said previously, unfortunately, I don't have direct measurements for the TEAC's XLR output. When passing the XLR output from the TEAC to the Emotiva pre-amp, the results at 2V peak volume coming out of the Emotiva slightly exceeds the direct RCA output from the TEAC DAC across the board from noise level to distortion levels to even lower stereo crosstalk. The high frequency roll-off is less than with RCA. 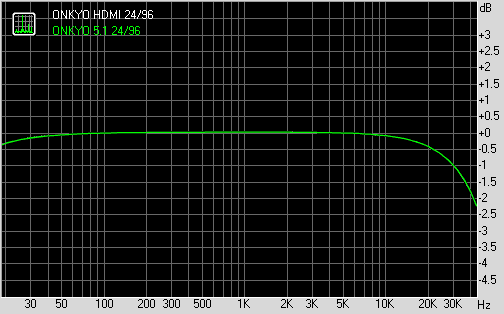 Notice just how clean the dynamic range graph looks as well through XLR cables. Fantastic. Remember, I am measuring the Denon in "DIRECT" mode with all audio processing including bass management turned off (front stereo speakers set to "Large" for the sake of completeness). Not unexpectedly, these results are clearly a step down from the Emotive XSP-1. 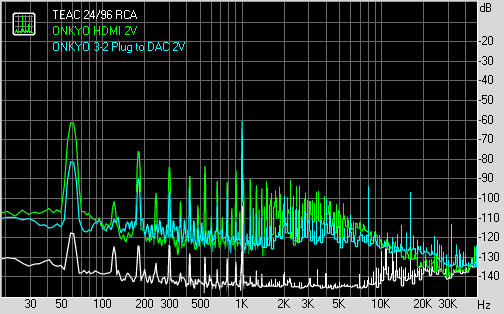 With a dynamic range of ~96dB at 2V, the Denon is capable of passing through 16-bit CD resolution but nothing more. Roll-off above 20kHz is similar to the Emotiva's unbalanced mode but worse than the Emotiva below 100Hz with a -1dB bass roll-off at 20Hz. With the ONKYO in "Pure Audio" mode, no video processing at all, HDMI and video inputs all disconnected... Wow! That's very impressive IMO for a machine that's a "jack of all trades". 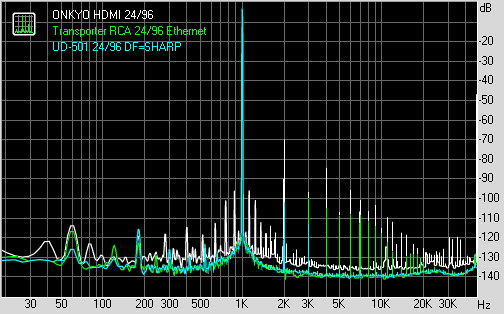 In fact, these results are almost the same as the Emotiva XSP-1 functioning in unbalanced mode! About 10dB improvement just by doing this. For now, I'm not going to bother isolating the problem further (I'll be moving house in about a month!) but suffice it to say that in a receiver setup with complex component interconnections, be very careful of noise polluting the analogue output as demonstrated above. Ground loops are very common especially with TV systems where ethernet and coaxial cables are often connected to the TV/receiver creating a number of potential ground points beyond the individual device plug-ins to the wall. So there you have it. The Emotiva XSP-1 measures as a very capable pre-amp unit with excellent resolution especially when used in a balanced configuration. 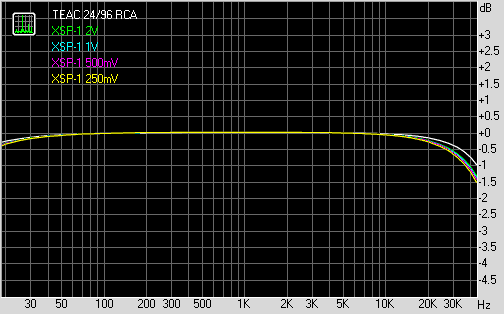 There was barely any loss through RCA and the XLR performance is beyond the E-MU 0404USB's measurement capabilities. Note that in all these tests, I'm just using generic "Radio Shack" type RCA connectors and the XLR cables are inexpensive Monoprice brand. No reason for spending money on expensive cables when these kinds of results can be obtained with standard decent interconnects. In "Pure Audio" mode without the HDMI system connected, the ONKYO performed excellently. It bested the 12-year old Denon AVR-3802 handily and is essentially neck-and-neck with the Emotiva in an unbalanced configuration. However, beware of the potential noise pollution and ground loops once you plug in all sorts of things into these receivers (like your fancy big screen TV)! A little while back, I spoke about how music sounded better through the Emotiva XSP-1 compared to using the Denon as pre-amp. These results are supportive of my subjective impressions (I'm showing >10dB dynamic range difference and bass roll-off differences between the two). As for the ONKYO, it does sound much like the Emotiva as a stand alone audio device. Since I will be listening primarily with the ONKYO as a HDMI DAC (either from the computer or through Blu-ray player), for me the digital audio performance is much more important than the results I show here from the analogue input. My kids enjoyed Les Misérables (the movie) and really love to listen to it in the car on the way to school... My favorite recording of this is the recent 25th anniversary UK Tour cast from 2010's performance called "Les Misérables Live!" - certainly much better singing than Hugh Jackman and Russell Crowe! Happy Canadian Thanksgiving long weekend everyone! Sadly we don't have the same "Black Friday" deals you lucky Americans enjoy :-). I realized something the other day... I refuse to be deprived of Dolby TrueHD and DTS-HD Master Audio (MA) in the new home theater / sound room! These are of course the "new" (DTS-HD MA announced back in 2004, TrueHD in 2005) lossless surround formats available on Blu-rays. Furthermore, I want to finally be able to play multichannel FLAC files created from DVD-A and SACD rips, of which I probably have about 100 albums archived away on my music server waiting for the day I can get a decent multichannel DAC (the recent USB exaSound e28 looks interesting). There is only one reasonable and relatively inexpensive way at this time - embrace the HDMI interface. Two options: either get a new surround processor like the Emotiva UMC-200 and use the external inputs of the Denon AVR-3802 for amplification purposes, or just upgrade the receiver to something (much) more modern since the AVR-3802 was bought at a time before adoption of HDMI (way back in 2002!). A multitude of I/O ports and connectors. I doubt I'd ever touch composite, S-Video, and component analogue inputs again! Now this specific model was released a couple years ago - it came out in mid-2011. It's "THX Select2 Plus" certified, capable of 9.2 surround, has 9 amplifier channels (potential for passive biamping the front speakers), all the usual digital sound decoding capabilities from Dolby and DTS along with 7.1 LPCM from HDMI up to 24/192, Audyssey MultEQ XT and the capabilities of HDMI 1.4 for video (3D, 4K upscaling). This model has since been superseded by the TX-NR929 (I would have thought the TX-NR1010 would have filled this role based on model number but the NR1010 actually has 7 amplifier channels, rather, the TX-NR3010 is the higher end model with 9 channels). In any case, it looks like the newer 2013 generation has Audyssey MultEQ XT32 (note the extra "32"; more and higher resolution room EQ control), built-in WiFi and Bluetooth, AirPlay, and 4K passthrough - cool but not essential for my purposes. 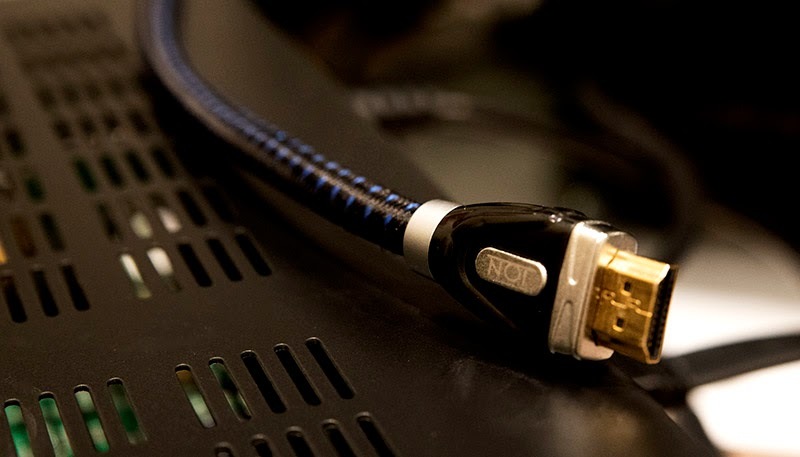 Compared to the stereo audiophile world where we argue about the audibility of PCM vs. DSD vs. minute differences between digital filters, the home theater domain brings with it more features than most music lovers would likely care to know... I suspect that as the technology continues to mature in the future, we will see stabilization of feature set and the need for upgrades will diminish for most end users; if this has not already started. Speaking of the future, 4K video is on the horizon though its mainstream commercial appeal is far from clear. I wonder if the consumer digital video world will play out like audio - 1080P becomes like the "CD standard" and 4K takes the role of SACD/DVD-A/hi-res downloads. The 4K image improvements can clearly be demonstrated (go have a look at a 4K TV near you), but other than videophiles and those with >60" screens, it's going to be hard to justify the improvement for most TV sizes, at most viewing distances. Also, there's currently precious little media out (the Sony XBR TV I saw comes with a Sony PC loaded with some sample material). 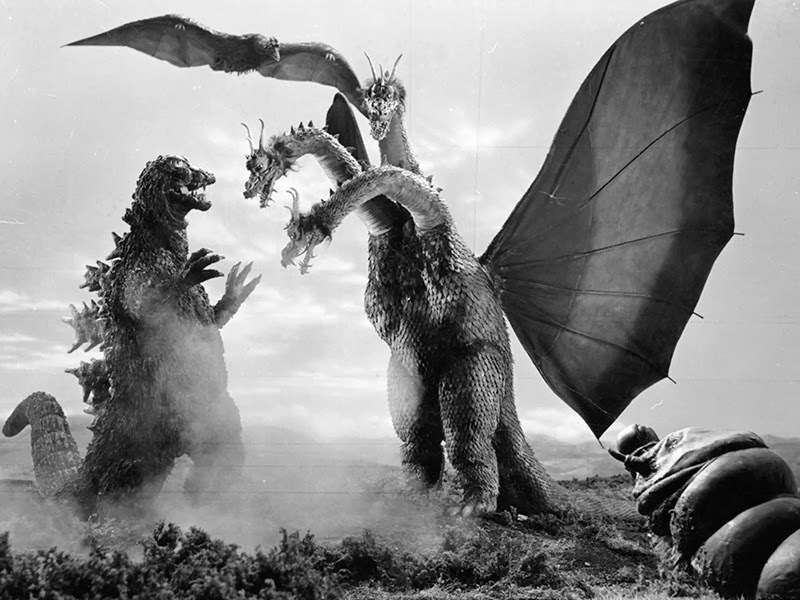 A new Blu-Ray standard needs to be formalized (see recent news about 100GB 3-layer BD). It's also unclear whether current Blu-Ray players can read these >2 layer disks; even if they can be read, I suspect the players might need H.265/HEVC decoding which likely means brand new hardware. One area I can see 4K could be beneficial to smaller screens is in synergy with passive 3D giving a full 1080P image per eye without the drawbacks of active 3D glasses (I've been using a 55" LG passive 3D TV now for 2 years so can attest to the resolution limitations)... However, 3D movies have not taken the world by storm so I'm not betting on this to fuel sales :-). I digress... Back to the ONKYO and sound... So far, I've plugged in my HTPC to try out the HDMI input - sounds great off the AMD A10-5800K "Trinity" computer for both music and movies; nicely detailed and dynamic. Multichannel SACDs sound great (DSD converted to multichannel FLAC played back with JRiver). Technically the amplifier portion does have more power than the Denon AVR-3802 with decent measured wattage even with 5 and 7 channels driven. With all DSP off and in "Pure Audio" mode, it's more "weighty" than my old Denon regarding bass impact; less "forward" sounding. It actually sounds closer to my recollection of the Simaudio Moon i3.3 integrated amp but that's of course from memory which we all know could be inaccurate. Anyhow, I'll try to run a few measurements on this machine in the next while when I have some time. 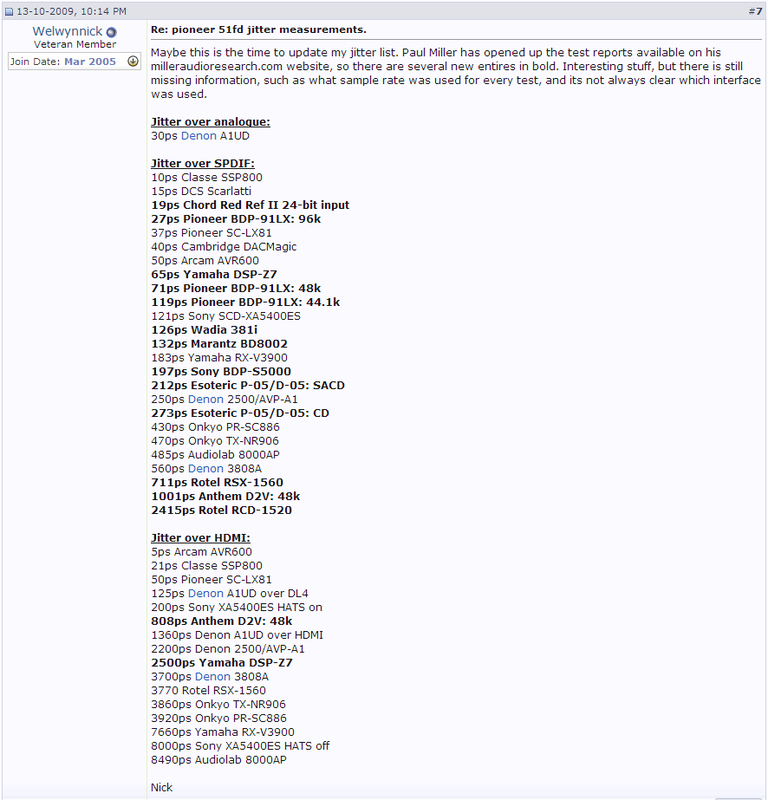 I'd certainly be very curious what the numbers/graphs look like compared to other DACs tested so far. According to the spec sheet, the DAC consist of an 8-channel TI PCM1690 and stereo TI PCM1789; both with rated SNR of 113dB - I'd certainly like to see if they can achieve anything close to this in a compact full-featured box with all the digital processing going on plus 9 power amplifier sections! This would also be the first time I'll have the opportunity to have an objective glimpse at performance off a recent HDMI implementation. BTW: Even though the ONKYO will be the heart of the surround system, I still have the Emotiva XSP-1 which will form the basis of the 2-channel signal chain. One which I will take advantage of once I get some monoblock amps; likely in 2014. Feargal Sharkey - Feargal Sharkey (1985), man, haven't heard "A Good Heart" for more than a decade! Also revisited another 80's memory: The Jitters "Last of the Red Hot Fools" (1987) - Canadian, eh? Life has been busy getting things done with the new home. Also, I went ahead and bought a new Paradigm SUB 1 to add to my home theater room along with a Signature C3 center channel - piano black of course :-)... Should be an exciting fall/winter as I get things up and running! 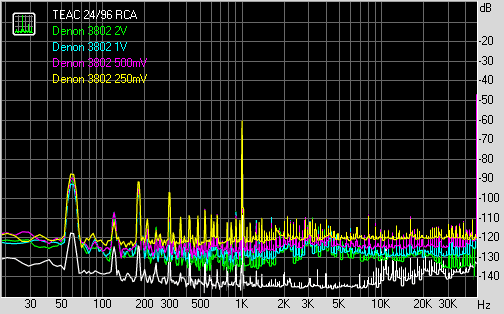 In the midst of this, I'm going to try getting a few comparison measurements of the pre-amp characteristics of the new Emotiva XSP-1 vs. my old Denon 3802 AV receiver to see objectively what differences can be found. There does appear to be a significant audible difference plugging a DAC into the XSP-1 then into the Denon external input and using the Denon as an amp compared to just plugging the DAC straight into the Denon as a pre-amp. 1. It looks like JRiver has new beta versions of JRMC 19 (19.0.51) which supports the TEAC UD-501's native ASIO DSD128 mode. No problem with using "2xDSD in native format" upsampling of PCM to DSD now. 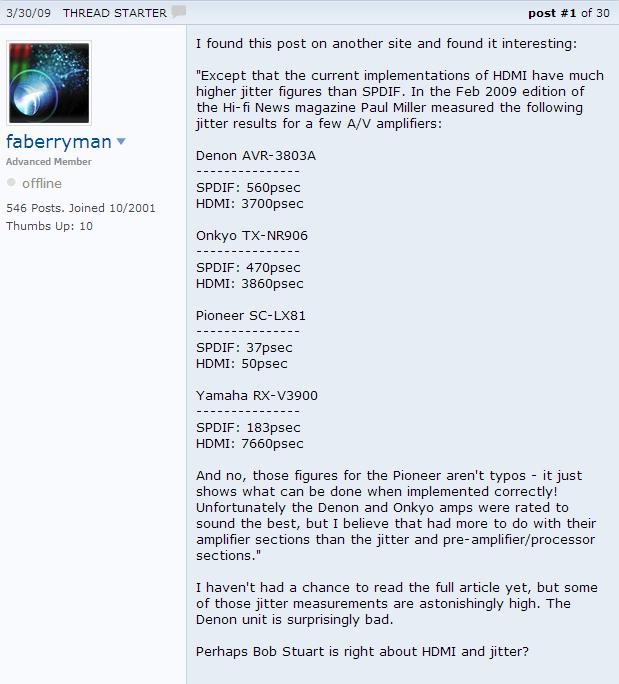 Thanks to InflatableMouse for getting TEAC and Matt over at JRiver talking. With this "fix", there's no need for ASIOProxy any more but I suppose the technique could be useful for other DAC's. Today, I want to discuss an interesting device which I heard back in early 2012 when a friend bought one (I think he might have even been on the wait list to be one of the first to get it)... The Wadia 121 Decoding Computer. I remember listening to it and thinking "this isn't bad". Details seemed reasonable. The remote feels good. I like the idea of good "lossless" volume control built into the DAC. I wasn't blown away by it though. Unfortunately, this was before I started writing this blog and spending time with measurements. "The Wadia 121 Decoding Computer is more than competent and competes with products double, triple, and quadruple its size... New computer audiophiles seeking their first entry into this wonderful next phase of high end audio can't go wrong by starting with the 121. They may never need another digital to analog converter." "The Wadia 121 Decoding Computer is the best affordable digital-to-analog converter that I've ever heard. No, I have not heard every affordable DAC on the planet – and there are new DACs in all shapes, sizes, and prices being released even as we speak. But given their track record, it is a safe bet that Wadia has not only put a lot of thought into the design of the Wadia 121, but this DAC won't be bested by any DAC for quite a few years to come..."
"To my way of listening, the Wadia 121Decoding Computer jumps right onto my short list of recommended components. It strikes me as being at once refined yet not overly resolute, with a voice that sounds like music. Sweet music. I enjoyed every listening minute spent regardless of the recording..."
Wins the "Greatest Bits" award. "...Though the music sounded like high-res digital—not vinyl—my brain still involuntarily registered surprise at the lack of clicks and pops. I suppose it associates them with a relaxed listening experience. "Home theater buffs tend not to think much about source components for music: We figure that as long as we own an Oppo, and maybe a turntable, we’re covered. That worked as long as music streaming was a low-res medium, merely a convenient plaything for background listening. But the advent of high-res downloads demands an upgrade if you want to get the best out of your investment in components and headphones. You just may need something exactly like the Wadia 121." Awarded 5/5 stars in the "Performance" category. "... Reading reviews is helpful (I hope), but I think a proven track record of producing high quality components is perhaps even more important. Here Wadia, well known for producing some of the finest digital playback equipment available since the earliest days of the medium, has brought its considerable talents to bear in producing a DAC which is operationally bullet-proof at an unexpectedly modest price. This is not simply another DAC-in-the-box with off-the-shelf parts and a marketing slogan, but a component with highly sophisticated software realized in DSP which has been decades in the making, coupled with an analog section which, to my ears, is completely transparent. And with no separate preamplifier needed, your budget for speakers has just doubled. I can’t recommend it highly enough." "I can state confidently that few, if any, potential purchasers will be disappointed by the 121’s sonics or ergonomics. I know that I could happily live with the Wadia 121—it’s that good." So, these are words of subjective reviewers. As I noted, for the price this DAC cannot really be considered "reference" level at least from the perspective of folks who likely have heard DACs in the $5000+ range and have some expectation of what these expensive DACs sound like. There are of course comments about how this DAC doesn't quite reach the level of those über-DACs. Here's a nice quote from the Computer Audiophile: "What separates the 121 Decoding Computer from the rarefied air of great but greatly expensive DACs is reduced depth, air, and low level detail when reproducing the best recordings from labels such as Linn Records, Naim, and Reference Recordings." Fair enough. "After more than a month of use and listening, when I used the 121 strictly as a DAC, I found that, in most cases, its sound had a marginally burnished or rounded quality that could help tame a recording with an unruly top end, or slightly veil a great recording." Basically, what the objective results show is that we have here a fancy looking DAC with some really cool "talking points" - well respected manufacturer Wadia, "ClockLink" asynchronous USB, "DigiMaster" interpolation, 32-bit 1.4MHz upsampling. But at the end of the day, it's not capable of achieving >16-bit resolution with USB, TosLink, and coaxial inputs. Even with the AES/EBU balanced digital cable, it's "only" capable of 17-18 bits. Unless one were to just use AES/EBU, there appears to be no point feeding 24-bit high resolution audio into this DAC - all those 24-bit HDTracks/Qobuz downloads would be wasted (unless you feel >44kHz sampling is much more important). To make matters worse, it seems like the USB input cannot even achieve a full 16-bit resolution - arguably THE most important interface these days. Knowing this, how can any reviewer hand out awards or grade this device as 5/5 on performance? Even if you like the way this device "sounds", isn't it still a sign of failure that it could not profit from the higher bit depth? Of course, it appears the purely subjective reviews could not comment on this "inconvenient" piece of information. Now, admittedly, there could have been something wrong with John Atkinson's measurements I suppose, but as of October 2013, I do not see any addendum to the review. I would imagine that a manufacturer would correct this situation ASAP! I feel that this is a good case study (one of many IMO) into why objectivism has an important if not essential place in audiophile equipment reviews. Bias and placebo are well recognized in domains of research where human qualitative evaluation is involved. I would argue even more so when reviewing "high fidelity" gear where at a certain level of quality, differences are likely very small and effects of biases become even greater - "look and feel" (pretty metal box with lights and metal remote), manufacturer reputation (ooohhh... Wadia), price ($1299 must be a pretty decent DAC right?) all can (and likely do) end up in the final evaluation of sonic quality in the absence of objective information. In some forums / web sites, it almost seems that certain reviewers feel that they are immune to this phenomenon, or even worse, have developed so much faith in their "golden ears" that they feel there is no benefit to empirical evaluation. Remember, thoughtfully designed audio devices are engineered. They were made based on electrical and (in instances like speakers or turntables) mechanical properties. Without examination of these properties to at least verify claims (eg. that a hi-res DAC is capable of >16-bit dynamic range being fed into it, or an amplifier is capable of the claimed watts with minimum distortion, etc...), I believe the reader cannot place strong value in the reviewer having fully appreciated the limitations/strengths of the device. I'm of course not opining that there be no subjective evaluation - fit and finish, ergonomics, ease of use, reliability, visual esthetics are all important. Likewise, sound quality needs to be checked subjectively. But there's no shame in admitting that in many ways, the human ear/brain is limited and measurement devices can easily enhance the quality of a review synergistically. There's no need to see this as black or white, subjectivist vs. objectivist. Until next time... Enjoy the tunes!